Special Olympics Pennsylvania’s (SOPA) Philadelphia program offered free physical examinations to 26 special education students at John Wister Elementary School on Tuesday, November 27, 2012 as part of a Mini-MedFest event. 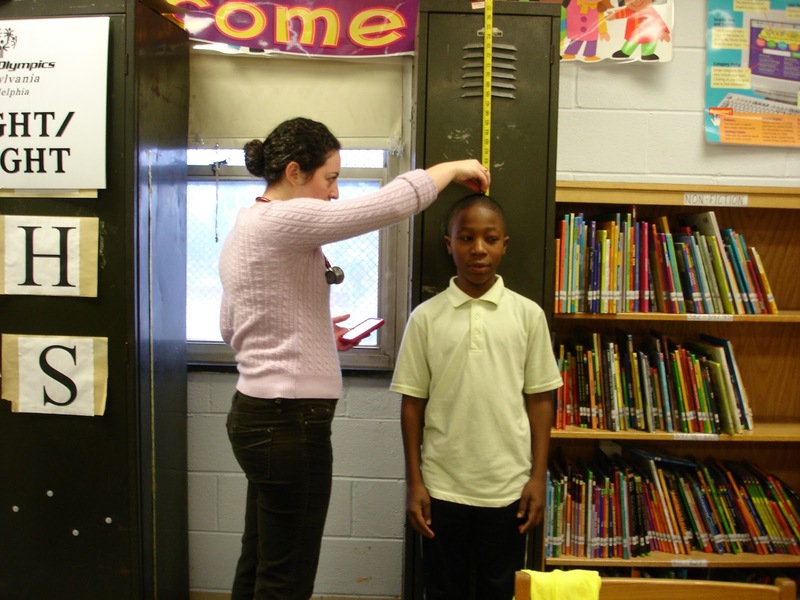 Medical personnel from Geniuses, Albert Einstein, Crozer, Drexel University, and Christiana Hospitals and the Philadelphia College of Osteopathic Medicine provided full screening services including eye exams, dental exams, and referrals for issues requiring additional medical attention. 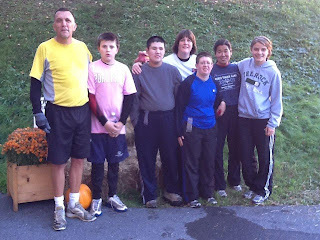 The goals associated with MedFest are to offer free sports physicals and other health screening services to people with intellectual disabilities; recruit new athletes to Special Olympics; foster new partnerships between Special Olympics and the community; and provide health care providers with training and specialized experience in the examination and assessment of people with intellectual disabilities. In many cases, life-threatening conditions have been found and subsequently treated thanks to MedFest. John Wister Elementary School currently participates in Project UNIFY®, an education-based project that uses the sports and education programs of Special Olympics to activate young people across the U.S in order to promote school communities where all young people are agents of change – fostering respect, dignity and advocacy for people with intellectual disabilities. 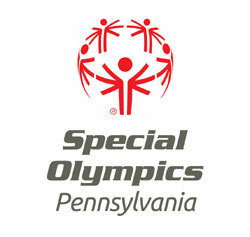 Plans are underway to hold a larger-scale MedFest on January 17, 2013 at the Wells Fargo Center in hopes of providing free medical examinations to more than 300 Special Olympics athletes and partners. For more information, please contact Nadirah D. McCauley, Outreach Director – Philadelphia at 215-671-5112 or nmccauley@specialolympicspa.org. 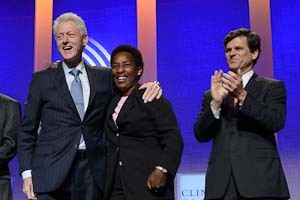 Special Olympics Pennsylvania - York County athlete Loretta Claiborne pictured with Former President William J. Clinton and Chairman and CEO of Special Olympics Tim Shriver at the 2012 Clinton Global Initiative. On September 23, 2012, Former President William J. Clinton announced that businessman and philanthropist Tom Golisano will provide $12 million to expand Special Olympics’ health-related services to people with intellectual disabilities - one of the largest and most medically underserved disability groups in the world – which will allow for the launch of a new Healthy Communities initiative. 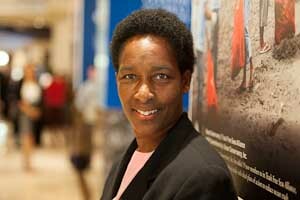 The commitment was made at the opening of the 2012 Clinton Global Initiative (CGI) Annual Meeting involving four Special Olympics athletes including PA athlete Loretta Claiborne. This is the largest single gift Special Olympics has ever received from an individual and it is the first gift made by Golisano that will have international impact. The gift will be given over four years. Millions with intellectual disabilities lack access to quality health care and experience dramatically higher rates of preventable disease, chronic pain and suffering, and premature death in every country around the world. Healthy Communities’ goal is to achieve improved health outcomes for people with intellectual disabilities with the ultimate goal of ensuring that all are receiving health services and are able to reach their full potential. It will expand services to more athletes, increase partnerships with local organizations, expand the use of technology, and promote awareness of the health difficulties facing people with intellectual disabilities. I remember when I was asked first asked about Healthy Athletes, many years ago. I had some reservations. I was a naysayer. Dr. Ron Vederman was trying to start it, and he said to me, "What do you think about Healthy Athletes?" I said, "I think we should stick to sports. Why do we want to get into the private lives of people's health?" Then I thought, "Dr. Vederman, you know what? I understand." If your feet don't feel well, you can't run well. But also you can't participate in the community with a job. If your teeth hurt, you don't eat well, and if you don't eat well, you can't take care of your body. If you can't see well, you can't bowl well. In the community, if you don't see well, you can't see what's going on. I don't read well, so I use my eyes and ears to learn and think about what's happening. Healthy Athletes is one of the best programs to come around for people with intellectual disabilities. With Healthy Communities, I see better lives and people living longer. And when you have a healthier community, you have a stronger community. Healthy Communities will really open the eyes of the community about people with intellectual disabilities. September 22, 2012 will mark the third annual Eunice Kennedy Shriver (EKS) Day celebrated around the world, bringing together people with and without intellectual disabilities in sport and other unifying activities to honor the inspiration, impact and indomitable spirit of Special Olympics’ founder, Eunice Kennedy Shriver. On this day Lebanon Valley College students and faculty will team up with Special Olympics athletes from Lebanon County to clean up Coleman Park from 9 a.m. to 2 p.m. in Annville, PA.
Their work at the park will include painting fences, making recycling barrels, clearing trails and removing fallen tree limbs. 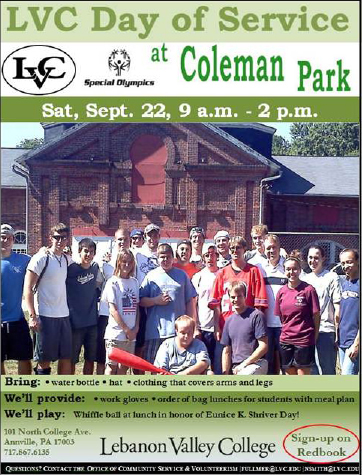 During lunch, the participants will play wiffle ball in honor of EKS Day and in response to the global call challenging everyone to “Play Unified to Live Unified” as part of Mrs. Shriver’s belief that people forget about their differences and recognize their mutual humanity on the playing field. 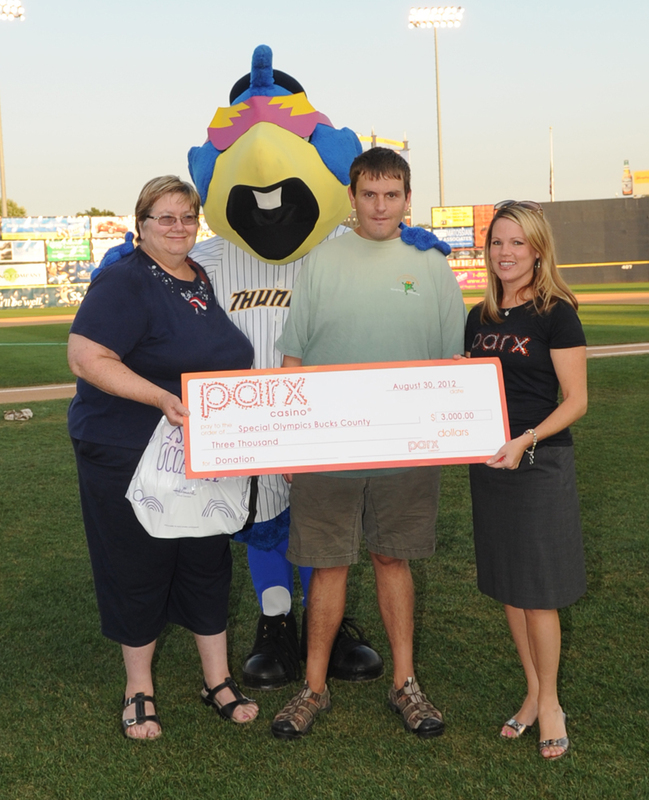 Special Olympics PA – Bucks County recently received a check in the amount of $3,000 from Parx Casino that pledged $50 for every double play and $500 for every triple play by The Trenton Thunder, a minor league baseball team, for the entire season. The check was presented on Thursday, August 30th prior to the final regular game of the season. The Thunder clinched first place and the playoffs begin in Trenton on Friday, September 7th. Pictured above from right to left: Carrie Nork Minelli, Parx Casino Director of Public Relations; Neil Reilly, Bucks County athlete; Boomer, Thunder mascot; and Eileen Reilly, Bucks County volunteer. Good luck to Stephanie Walther, a Bucks County athlete headed to San Juan, Puerto Rico for the Global Swimming Invitational! She is among 300 Special Olympics athletes that will compete in the swim meet, hosted by Special Olympics Latin America, September 10-17. 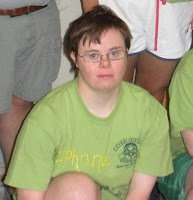 Stephanie, 29 years old, has been involved in Special Olympics since 1989. She has competed as a powerlifter at the 2003 Special Olympics World Summer Games in Dublin, Ireland and the first-ever Special Olympics National Games in Ames, Iowa in 2006. 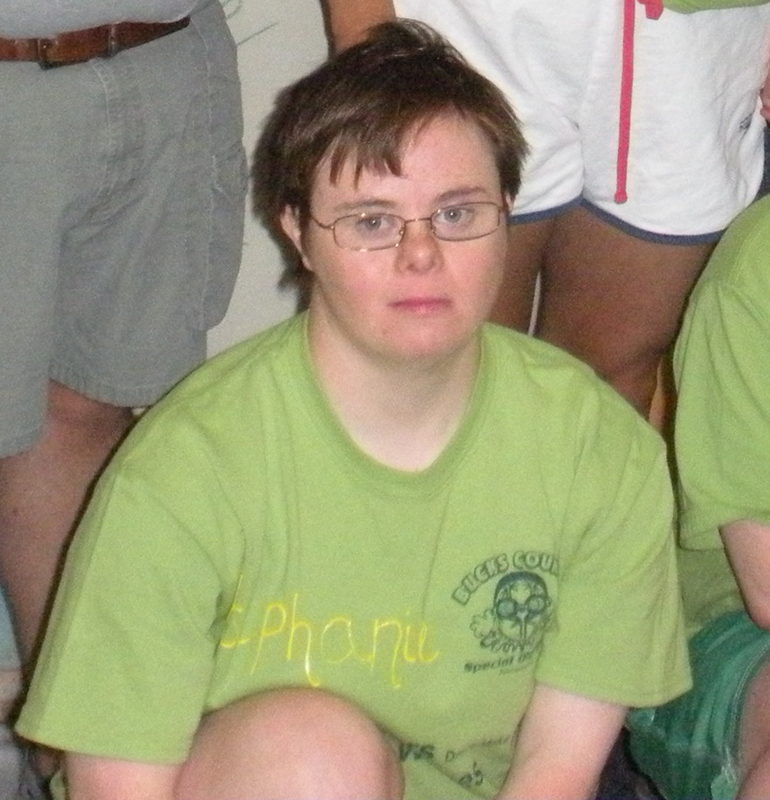 The sports that she currently participates in are bowling, basketball, bocce, powerlifting, swimming, and tennis. Following a several year absence, the Huntingdon County program is now back and ready to serve Special Olympics athletes. Bocce will be the program’s primary sport as they begin their reintroduction into the community and gear up for practice on August 6th with two dozen athletes and six trained coaches. Donations and/or discounted items from the Sherry J. Leonard Memorial, Your Building Center of Huntingdon, and Shapiro Flooring of Mount Union have made the purchase of two bocce courts possible. And with all of the recent buzz and excitement, the program is sure to expand exponentially. Getting the program back onto its feet took the dedication of an amazing management team made up of individuals from three local programs, Blair, Huntingdon, and Mifflin counties, under the leadership of Co-Managers Cory Sisto and Michele DeVecchis. Jim Wenner, a SOPA board member, Sheetz, Inc. executive and Huntingdon County resident, has also been pivotal in reinitiating the program by encouraging four of his Sheetz employees to join the management team. Additionally, the program’s reestablishment has been a prime focus for Special Olympics Pennsylvania (SOPA) President and CEO Matt Aaron and SOPA Sr. Field Director (Central) Rich Lewis. 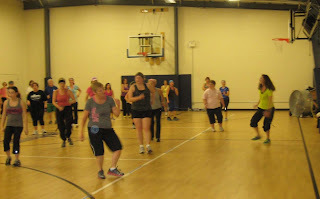 Huntingdon County has been busy hosting demonstrations and received the support of Sheetz to provide food for their participants. They have also organized their own sports programs at the local level. As the program makes its comeback, fundraising is of course at the forefront of their efforts. The SOPA community is happy to have this part of its family back, and they are off to a great start! Huntingdon County is looking for athletes, coaches, and volunteers, so please get involved if you live in the Huntingdon County area. To learn more about volunteer opportunities or ways to give, email huntingdonolympics@gmail.com . Special Olympics started out as one woman’s discontent. It has now been turned into a worldwide effort dedicated to giving those with intellectual disabilities a place to play and compete. In the 1960’s Eunice Kennedy Shriver became frustrated when she realized the lack of opportunities and unfair treatment being cast upon intellectually challenged children and adults. She not only wanted them to feel a part of the community, but to give them a place where they could focus on what they did well. The first glimpse of what Special Olympics would become was in her backyard in 1962. Shriver held a summer camp giving kids the chance to feel free and have fun. At camp they swam played sports and interacted with not only other campers but Shriver’s children as well. Tim Shriver says, "I was never introduced to disability or intellectual disability as a cause but more as an activity. Never as a burden, but rather as a joy. Our introduction to people with special needs was to swim or to play kickball or to go horseback riding. Part of her genius [has] always been to create things that are appealing, create opportunities that are joyful that people want to join, that make things fun." Not only were the children’s lives changed but those of the Shriver’s as well. Seeing the impact and growth over the short summer weeks, Shriver helped to create the Special Olympics Summer Games. In 1968, the first official Special Olympics were held in Chicago. On July 20, Soldier Field was filled with 1,000 athletes from over 26 states. 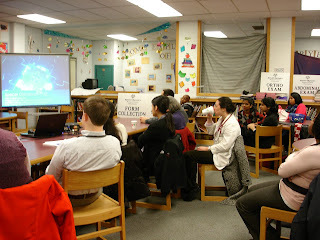 They competed in three events, swimming, track and field, and floor hockey. "The Chicago Special Olympics prove a very fundamental fact," Eunice said. "That exceptional children - children with mental retardation - can be exceptional athletes, the fact that through sports they can realize their potential for growth." The growth in Special Olympics today is tremendous. Over 3.7 million athletes in over 170 countries come to compete in events year round. Shiver set out to rectify injustice, and accomplished so much on her journey. Her lists of awards are endless along with the programs, foundations, and event she pioneered. She was a woman with a big heart, ambition, and the passion to help those with disabilities. 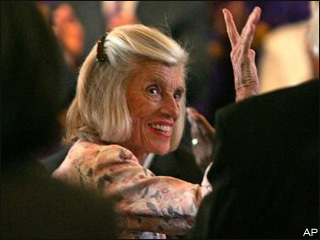 "Eunice Kennedy Shriver: One Woman's Vision." Eunice Kennedy Shriver: One Woman's Vision. N.p., n.d. Web. 05 July 2012. .
"Special Olympics." Special Olympics. N.p., n.d. Web. 05 July 2012. . 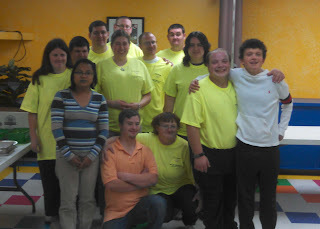 Spread the Word to End the Word™ is a Special Olympics campaign to eliminate use of the words "retard" and "retarded." 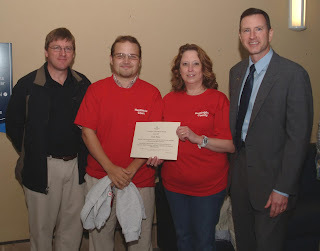 Its goals are to promote the contributions made by people with intellectual and developmental disabilities and to educate the public about the damaging effects of the "R-word." 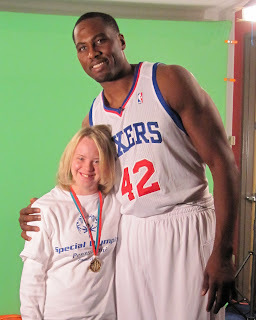 The NBA has a longstanding partnership with Special Olympics, and this year, members of the Philadelphia 76ers, including forward Elton Brand and point guard Jrue Holiday, participated in the Spread the Word to End the Word campaign. 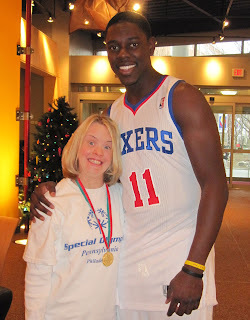 Jrue Holiday teamed up with Special Olympics Pennsylvania athlete Katie Moore to record a PSA to promote the campaign and encourage everyone to pledge their support. National Awareness Day for the campaign was on March 7, but the mission of spreading the word to end the word is still ongoing. How can you be a part of it? Make a pledge today to eliminate the use of the R-word at r-word.org. with Elton Brand (top) and Jrue Holiday.